The conifers, division Pinophyta, also known as division Coniferae, are one of 13 or 14 division-level taxa within the Plant Kingdom (Plantae). They are cone-bearing seed plants (specifically gymnosperms) with vascular tissue. All living conifers are woody plants, the great majority being trees with just a few being shrubs. Typical examples of conifers include cedars, cypresses, firs, junipers, pines, redwoods, spruces, and yews. Conifers can be found growing naturally in almost all parts of the world, and are frequently dominant plants in their habitats. Conifers are of immense economic value, primarily for timber and paper production. They have played an important part in many human cultures and are grown in gardens and enjoyed in nature around the world for their quiet beauty. In many homes a young conifer is brought in each year to serve as a Christmas tree. The reproductive cycle of many conifers also exhibit the harmony among living organisms, as many species require a symbiotic relationship with birds, squirrels, and other animals in order to release their seeds for germination. Conifers are gymnosperms, along with three much smaller plant divisions: Ginkgophyta (the ginkgo tree), Cycadophyta (the cycads)), and Gnetophyta (the genera Gnetum, Ephedra, and Welwitschia). As gymnosperms, conifers bear their seeds "naked"; not covered by an ovary. The other type of seed plants, the angiosperms (flowering plants), cover their seeds by including them in a true fruit. The division Pinophyta consists of just one class, Pinopsida. This includes four orders, three of which (Cordaitales, Vojnovskyales, Voltziales) are long extinct and known only through fossils. 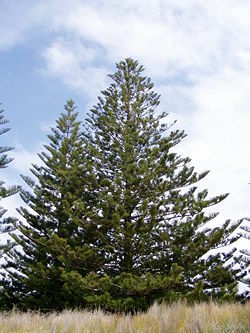 All living conifers are members of the order Pinales, which is generally divided into seven families. All living conifers are woody plants, and most are trees, the majority having monopodial growth form (a single, straight trunk with side branches) with strong apical dominance (the truck is dominant over the branches). The size of mature conifers varies from less than one meter (3 feet), to over 100 meters (330 feet). The world's tallest, largest, thickest, and oldest living things are all conifers. The tallest is a Coast Redwood (Sequoia sempervirens), with a height of 113 meters (370 feet). The largest is a Giant Sequoia (Sequoiadendron giganteum), with a volume of 1,490 cubic meters (17,300 cubic feet). The thickest, or tree with the greatest trunk diameter, is a Montezuma Cypress (Taxodium mucronatum), 11.5 meters (38 feet) in diameter. The oldest is a Great Basin Bristlecone Pine (Pinus longaeva), 4,700 years old. 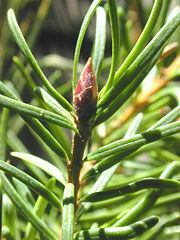 The leaves of many conifers are long, thin, and needle-like, but others, including most of the Cupressaceae and some of the Podocarpaceae, have flat, triangular scale-like leaves. Some, notably Agathis in Araucariaceae and Nageia in Podocarpaceae, have broad, flat, strap-shaped leaves. In the majority of conifers, the leaves are arranged spirally. In many species, the leaf bases are twisted to present the leaves in a flat plane for maximum light capture (e.g. Grand Fir Abies grandis). Leaf size varies from 2 millimeters (.08 inches) in many scale-leaved species, up to 400 millimeters (16 inches) long in the needles of some pines (e.g. Apache Pine Pinus engelmannii). The stomata are in lines or patches on the leaves, and can be closed when it is very dry or cold. The leaves are often dark green in color which may help absorb a maximum of energy from weak sunshine at high latitudes or under forest canopy shade. Conifers from hotter areas with high sunlight levels (e.g. Turkish Pine Pinus brutia) often have yellower-green leaves, while others (e.g. Blue Spruce Picea pungens) have a very strong glaucous wax bloom to reflect ultraviolet light. In the great majority of genera, the leaves are evergreen, usually remaining on the plant for several (2-40) years before falling, but five genera (Larix, Pseudolarix, Glyptostrobus, Metasequoia and Taxodium) are deciduous, shedding the leaves in autumn and leafless through the winter. The seedlings of many conifers, including most of the Cupressaceae, and Pinus in Pinaceae, have a distinct juvenile foliage period where the leaves are different, often markedly so, from the typical adult leaves. The leaves of the conifers give them an advantage over broad-leafed trees in cold environments and in environments with a dry season in summer. Since most are evergreen, they can carry on photosynthesis on sunny winter days when most broad-leafed trees are leafless. They also have the advantage of not having to expend the extra energy every year to produce a new crop of leaves in spring (Pielou 1988). Most conifers bear both male and female cones on the same plant. All are wind-pollinated. The male cones have structures called microsporangia which produce yellowish pollen. Pollen is released and carried by the wind to female cones. Pollen grains from living pinophyte species produce pollen tubes, much like those of angiosperms. When a pollen grain lands near a female gametophyte, it undergoes meiosis and fertilizes the female gametophyte. The resulting zygote develops into an embryo, which along with its surrounding integument, becomes a seed. Conifer seeds develop inside a protective cone called a strobilus (or, very loosely, "pine cones," which technically occur only on pines, not other conifers). 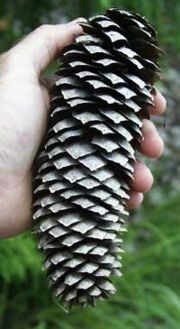 The cones take from four months to three years to reach maturity, and vary in size from 2 to 600 millimeters (0.08 to 24 inches) long. In Pinaceae, Araucariaceae, Sciadopityaceae and most Cupressaceae, the cones are woody, and when mature the scales usually spread open allowing the seeds to fall out and be dispersed by the wind. In some (e.g. firs and cedars), the cones disintegrate to release the seeds, and in others (e.g. the pines that produce pine nuts) the nut-like seeds are dispersed by birds (mainly nutcrackers and jays) and mammals (mainly squirrels), which break up the specially adapted softer cones. Ripe cones may remain on the plant for a varied amount of time before falling to the ground; in some fire-adapted pines, the seeds may be stored in closed cones for up to 60-80 years, being released only when a fire kills the parent tree. 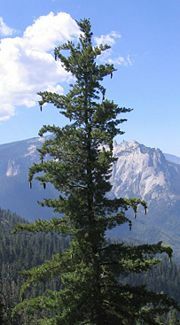 The Sugar Pine, Pinus lambertiana, of western North America is the largest pine. The family Pinaceae (pine family) includes many of the well-known conifers of commercial importance, such as cedars, firs, hemlocks, larches, pines, and spruces. It is the largest conifer family in species diversity, with between 220-250 species (depending on taxonomic opinion) in 11 genera, and the second-largest (after Cupressaceae) in geographical range, found in most of the Northern Hemisphere with the majority of the species in temperate climates but ranging from subarctic to tropical. One species just crosses the equator in Southeast Asia. Major centers of diversity are found in the mountains of southwest China, central Japan, Mexico, and California in the United States. Members of the pine family are trees (rarely shrubs) growing from 2 to 100 meters tall, mostly evergreen (except Larix and Pseudolarix, deciduous), resinous, monoecious, with subopposite or whorled branches, and spirally arranged, linear (needle-like) leaves. The female cones are large and usually woody, 2 to 60 centimeters (1 to 24 inches) long, with numerous spirally-arranged scales, and two winged seeds on each scale. The male cones are small, 0.5 to 6 centimeters (0.2 to 2.4 inches) long, and fall soon after pollination; pollen dispersal is by wind. Seed dispersal is mostly by wind, but some species have large seeds with reduced wings, and are dispersed by birds and mammals. The embryos are multi-cotyledonous, with 3-24 cotyledons. The Araucariaceae are a very ancient family. They achieved maximum diversity in the Jurassic and Cretaceous periods, when they existed almost worldwide. At the end of the Cretaceous, when dinosaurs became extinct, so too did the Araucariaceae in the Northern Hemisphere. There are three genera with 41 species alive today, Agathis, Araucaria, and Wollemia, all derived from the Antarctic flora and distributed largely in the Southern Hemisphere. By far the greatest diversity is in New Caledonia (18 species), with others in southern South America, New Zealand, Australia, and Malesia (a region including the Malay Peninsula, Indonesia, the Philippines, New Guinea, and other areas straddling the boundary of the Indomalaya and Australasia ecozones), where Agathis extends a short distance into the Northern Hemisphere, reaching 18° N in the Philippines. All are evergreen trees, typically with a single stout trunk and very regular whorls of branches, giving them a formal appearance. Several are very popular ornamental trees in gardens in subtropical regions, and some are also very important timber trees, producing wood of high quality. Several have edible seeds similar to pine nuts, and others produce valuable resin and amber. In the forests where they occur, they are usually dominant trees, often the largest species in the forest; the largest is Araucaria hunsteinii, reported to 89 meters (292 feet) tall in New Guinea, with several other species reaching 50 to 65 meters (165 to 210) tall. The petrified wood of the famous Petrified Forest in Arizona are fossil Araucariaceae. During the Upper (Late) Triassic the region was moist and mild. The trees washed from where they grew in seasonal flooding and accumulated on sandy delta mudflats, where they were buried by silt and periodically by layers of volcanic ash which mineralized the wood. The fossil trees belong generally to three species of Araucariaceae, the most common of them being Araucarioxylon arizonicum. Some of the segments of trunk represent giant trees that are estimated to have been over 50 meters tall (165 feet) when they were alive. Podocarpaceae is a large family growing mainly in the Southern Hemisphere with 18-19 genera and about 170-200 species of evergreen trees and shrubs. The family is a classic member of the Antarctic flora, with its main centers of diversity in Australasia, particularly New Caledonia, Tasmania, and New Zealand, and to a slightly lesser extent, Malesia and South America (in the latter, primarily in the Andes mountains). Several genera extend north of the equator into Indo-China and/or the Philippines. Podocarpus additionally reaches as far north as southern Japan and southern China in Asia and Mexico in the Americas, and Nageia into southern China and southern India. Two genera also occur in sub-Saharan Africa, the widespread Podocarpus and the endemic Afrocarpus. 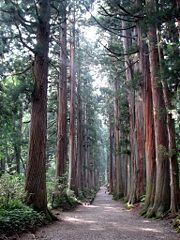 The Koyamaki (Sciadopitys verticillata) or Japanese Umbrella-pine, is endemic to Japan. 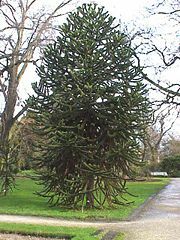 It is the sole member of the family Sciadopityaceae and genus Sciadopitys, a living fossil with no close relatives and known in the fossil record for about 230 million years. The Koyamaki is an evergreen tree that can grow 15 to 27 meters (50 to 90 feet) tall, with brown main shoots bearing whorls of 7 to 12 centimeters (3 to 5 inches), long flexible green cladodes that look like, and perform the function of, leaves but are actually composed of stem tissues; occasionally, a cladode will be forked and produce a bud in the 'v' of the fork. The cones are 6 to 11 cm (2.5 to 4.5 inches) long, mature in about 18 months, and have flattish scales, which open to release the seeds. It is a very attractive tree and is popular in gardens, despite its slow growth rate and high cost. Sugi, Cryptomeria japonica, the national tree of Japan. The Cupressaceae or cypress family includes 27 to 30 genera and 130 to 140 species. Its species are found worldwide in both the southern and northern hemispheres and include cypresses, bald cypresses, junipers, and redwoods. Many are valuable to humans for timber and other products. They are also widely grown in gardens and parks because of their unique beauty. The national trees of Japan and Mexico and the state trees of Louisiana and California in the United States are members of the cypress family. The family Cepahlotaxaceae is small, with three genera and about 20 species, closely allied to the Taxaceae, and included in that family by some botanists. They are restricted to East Asia, except for two species of Torreya found in the southwest and southeast of the United States; fossil evidence shows a much wider prehistorical Northern Hemisphere distribution. These are much branched, small trees and shrubs. The leaves are evergreen, spirally arranged, often twisted at the base to appear two-ranked. They are linear to lanceolate, and have pale green or white stomatal bands on the undersides. The male cones are 4 to 25 mm (0.16 to 1 inch) long, and shed pollen in the early spring. The female cones are reduced, with one to a few ovuliferous scales, and one seed on each ovuliferous scale. As the seed matures, the ovuliferous scale develops into a fleshy aril fully enclosing the seed. The mature aril is thin, green, purple, or red, soft and resinous. Each ovuliferous scale remains discrete, so the cone develops into a short stem with one to a few berry-like seeds. They are probably eaten by birds or other animals which then disperse the hard seed undamaged in their droppings, but seed dispersal mechanisms in the family are not yet well researched. The family Taxaceae, commonly called the yew family, includes three genera and about 7 to 12 species, or in other interpretations six genera and about 30 species. Yews are found around the world, mostly in the Northern Hemisphere. Most are poisonous to humans (the family and generic names have the same root as the word "toxic") and some have traditional medical uses in many cultures. 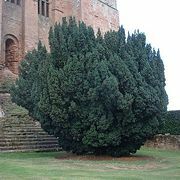 The European Yew, Taxus baccata, had a great importance in Medieval times as the source of the best wood for long bows and was often credited with supernatural powers, being traditionally planted in churchyards. 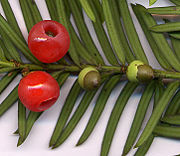 The bark of the Pacific Yew, T. brevifolia, is now being used to make the anti-cancer drug Taxol (Hartzell 1991). Earle, C. J. 2006. The Gymnosperm Database. Retrieved June 25, 2007. Hartzell, H. 1991. The Yew Tree Eugene, OR: Hulogosi. This page was last modified on 3 April 2008, at 19:22.